The Sinhala-Buddhist monk, Ampitiye Sumanarathna Thero, who is now boldly and publicly genocidal in speech against Eezham Tamils and Tamil-speaking Muslims, was earlier appeasing the LTTE and was even participating in the LTTE programmes when it was in control of the East, sources in Batticaloa revealed. The monk is only a representative of the age-old deception that is the reality of the Sinhala-Buddhist State, first set by British colonial geo-polity, and then to continue which, Washington, New Delhi and a bandwagon of Establishments tilted the balance hard-achieved by the nation of Eezham Tamils. It is for an imposed agenda that doesn’t shun genocide to sustain a State model at the southern tip of South Asia to serve imperialisms, both the Right and the so-called Left are orchestrated to uphold ‘Sri Lanka’ against all realities, Tamil activists for alternative politics commented. The programme of all the imperialisms centres-around the willingness of the Colombo-centric agent State to market the Sinhala-Buddhist military to serve as lascarines to whom so ever facilitate the erasure of Eezham Tamil nation in the island. So, the paradigm is Army and Theravada Buddhism; the tactics is to deploy globally simulated religious passions to override the national question demanding revision of single State model for the island. The responses for the monk-talk coming in Sinhalese-run media would show secret or sometimes unconcealed appreciation. Such monks have become almost a cult in the island. The paradigm will set inspiration elsewhere too, as desired by imperialisms. The monk-talk is simply the typical Sinhala-style variation of how the colonial masters behaved with all the natives including the post-1815 Kandyan Sinhalese. Eezham Tamils and Muslims have to be thankful to Sumanarathna Thero for showing the reality smoke-screened by the “reconciliation” reports of the US State Department, the UN agencies, the hired media writers etc. Contrary to deceptive claims by some Tamil articulators in the service of the outgoing US Administration and pre-emptive jump of Sinhala circles voicing “relief”, there was no meaningful programme at all in Geneva for the coming March sessions. The foremost reality is that the plight of the Tamil politicians, acting at the behest of Sri Lanka-saving agenda of the imperialisms and aspire for positions in the Colombo-centric system, is not going to be any different from the plight of the Tamil village official at the hands of this monk. The village official certainly stands high for calmly facing all the racist abuse and even death threats, and finally coming out with the brief, muffled remark, asking: “is it a talk coming from a Buddhist monk?” The Tamil politicians misguiding Tamil polity will not get the appreciation in history, even when they regret later just like their predecessors in more than a century. The global Tamil polity has to think of different diplomacy and strategies to face the imperialism-decided structural genocide. The first step is to denounce the ‘Sri Lankan’ identity set by the geopolity of the ultimate culprits. This has to come from the hearts of Eezham Tamils, who are now conditioned to recite the post-1972 and post-2009 ‘Sri Lanka’ identity. Tamils should see the model of how the Kurds identify themselves even when they don’t have a State. If Tamils want the edification of their political articulators and the ultimate culprits to conceive a model beyond a single State for the island, then the grassroot has to come out of the illusion of ‘Sri Lanka’ in their words and deeds. They could always repeatedly listen to the monk-talk to remind themselves of the need. During the times of the LTTE, and especially during the early 2000s when the Sinhala Establishment interpreted Tigers as invincible, Sinhala extremist Buddhist monk Ampitiye Sumanarathna thero was even appeasing the Tigers by appearing in the stage in some of the memorial and uprising events organised by the Tigers during the times of the peace process, Tamil political observers in Batticaloa said. 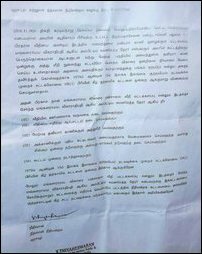 As the video of Ampitiye Sumarathna thero, filmed while he was verbally abusing Tamil GS officer Mr Jeevithan from Kachchatkodi-Swamimalai in Batticaloa district, went viral through social media last week, the public sector workers from all the 14 Divisional Secretariats in the Batticaloa district staged protests and processions demanding legal action against the monk from the SL police and the judiciary. 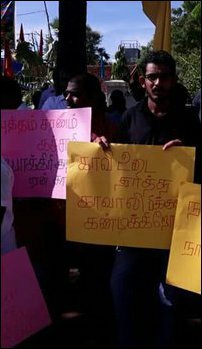 The protesters were also demanding political action from the Colombo regime to evict the extremist monk from Batticaloa district. Tamil National Alliance (TNA) Parliamentarian S. Yogeswaran, former TNA MP P. Ariyanethiran, Eastern Provincial Councillors R Thuraireththinam and N. Indirakumar (Prasanna) were also present at the protest expressing their solidarity. The protesters were demanding security to GS officers. However, undeterred by getting exposed in the social media on 11 Friday, the monk went on intrusive mission on 16 November at Pankudaa-ve'li. He was attempting to place a Buddha statue inside the lands of Tamils. When the villagers protested and the SL Police came, the monk started to demand Batticaloa District Government Agent to come and meet him. The incident took place 16 km north of Batticaloa city. Pankudaa-ve'li is situated in Ea’raavoor-pattu (Chengkaladi) division in Paduvaankarai region of Batticaloa district. Responding to monk’s entry into the private property at Pankudaa, the Magistrate of Circuit Magistrate’s Court at Ea’raavoor V. Thiyageswaran on the same day issued an interim order prohibiting the abusive Sinhala Buddhist monk Ampitiye Sumanaretha from 1) staging processions on the streets; 2) staging protests blocking streets 3) entering the above mentioned private lands 4) attempting to plant trees and/or erecting constructions for building or statues 5) conducting any meeting. The Magistrate also instructed the police to take legal action against the monk without hesitation in case he violated the above interim order, which was based on the “Code Of Criminal Procedure Act (No. 15 of 1979) - Section 106(1)”. The Magistrate, who is a Tamil, was referring to the request coming from SL Police OIC of Karadinyanaa’ru Mr P.P.Senanayake, a Sinhalese. The Buddhist monk has earlier gone on record describing the courts in East as belonging to “Thambiya” [derogatory term against Muslims] and “Demalas” [meaning Tamils].